I will get the basics out of the way. 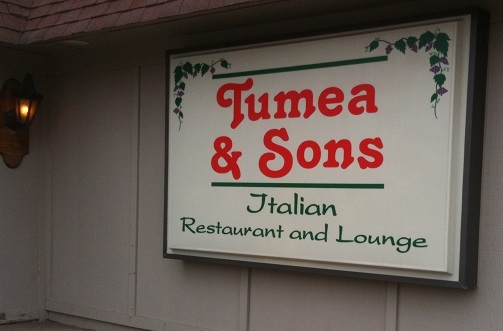 Tumea and Sons Italian Restaurant and Lounge is actually of fairly recent vintage, having been established in 1998. Not being a southsider, I had just assumed that it had been around for a long time as it does not have that shiny new look. But when i think about, it I can’t recall visiting the place before 1998, so I’ll take what they post on the website as gospel. I just assumed that I had not heard about it or had not driven by the place because it is hard to find. I can never find the place. It is tucked away in the southeast side bottoms just across from the ballpark. The actual address is 1501 Southeast 1st Street if you want (or need) to plug it into the GPS. Anyway, about the place. It was pretty well packed when we visited. There were cops, firefighters, a lawyer lobbying a well-known City of Des Moines politico, a table of what looked like a bunch of middle managers from a plumbing company and a parking lot full of shiny Cadillacs and Benzes. So, it obviously gets the vote from the City of Des Moines establishment. The walls are covered with family photos, a crucifix or two, some posters of Italy, and other assorted things. The wall accoutrements looked like they were authentic and not grabbed off of an antique floor like you see in Italian chains like Buca di Beppo. So, we were duly warned while discussing the menu NOT to try the manicotti with vegetables that day. Something about the mushrooms not being up to snuff. I like it when I get good directions on what not to get. So, I ordered the manicotti with cheese. My partner ordered the Penne Salsiccia. I didn’t get the impression that the pasta in either dish was scratch made, but maybe I just didn’t notice. 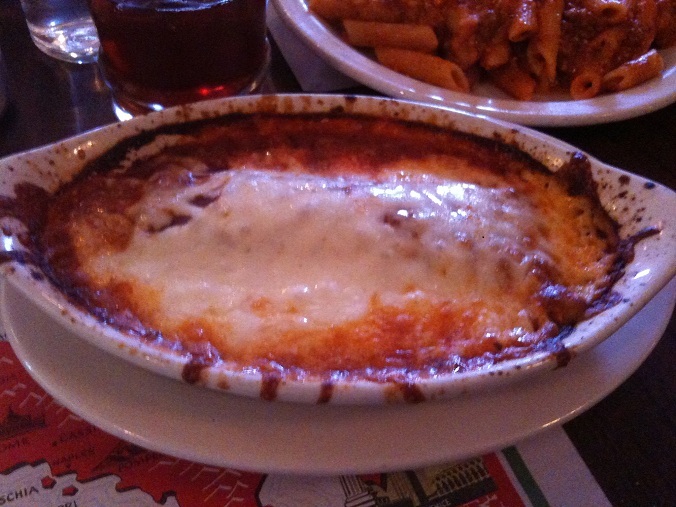 The sauces were very tasty and sweet and the manicotti was full of cheese as promised. The Penne Salsiccia came with ground sausage (I think it was Graziano sausage, some of which can be hot by itself) and red peppers in red sauce and butter wth Romano cheese. The sausage and red peppers made it quite hot. Based on the clientele and the food I tried I would say that this is honest Italian food consistently prepared. The prices were a bit high for a lunch but fair for the amount of food that was served. If you are hungry you get your money’s worth. The dinner prices for the meat plates are higher as well but when I’ve had a full dinner meal you get supplied with ample amounts of food for the price — far more than any normal human can consume. The place brings out the white table cloth and lowers the lights for dinner to create a more sophisticated atmosphere, which also helps justify the higher dinner price. Prices for pasta dishes are very reasonable for dinner. Tumea’s red sauce is my absolute favorite in Des Moines! Thick and a little spicy, marvelous flavor, I always ask for extra sauce so I can slather my leftovers for lunch the next day. Thanks for the review – reminds me that we haven’t been to Tuemea’s in way too long! Fixed your typo. Also, I’ll be featuring some other food blogs in an upcoming posting and yours will be included. Great graphics and setup. Any suggestions for which Italian American restaurant to visit next? I’m thinking Latin King or Barattas. Thanks in advance for including us in your upcoming post. We’re having a blast with our blog so far. We haven’t been to Barattas for quite a while, but Latin King is consistently top notch. I love the Spaghetti Carbonara there and their meatballs are sublime. It can sometimes be a long wait, especially on the weekends, but so worth it.